So, 'Music' is a very cool, successful and award winning design agency located in Manchester's achingly trendy 'Northern Quarter'. In keeping with their reputation for sleek, simple and effective design they have just installed an office with floor to ceiling glass walls and door. Unfortunately, this trendy and transparent development has become something of a hazard, with staff and visitors not realizing where the glass panels are, and bumping into them. This is where we come in. By 'we' I mean me and the rest of my illustration class. We have been asked to submit ideas for design solutions that will solve this problem, reflect the agency well and keep to the 'Music' design philosophy. We have also been asked to submit designs based on a music track. My proposal is based upon the song ‘Heroes’ by David Bowie. The idea is to give people using the office the chance to become their musical ‘heroes’. I propose to display the key recognisable facial features of a particular musical icon on each of the glass panels (and the door), leaving space for the viewer to put their own face and ‘become’ that character. Each individual icon is created through cutting simple, graphic shapes out of vinyl and sticking them to the glass. I have deliberately chosen musicians that can be defined and recognised by certain prominent features( for example hair and make up). 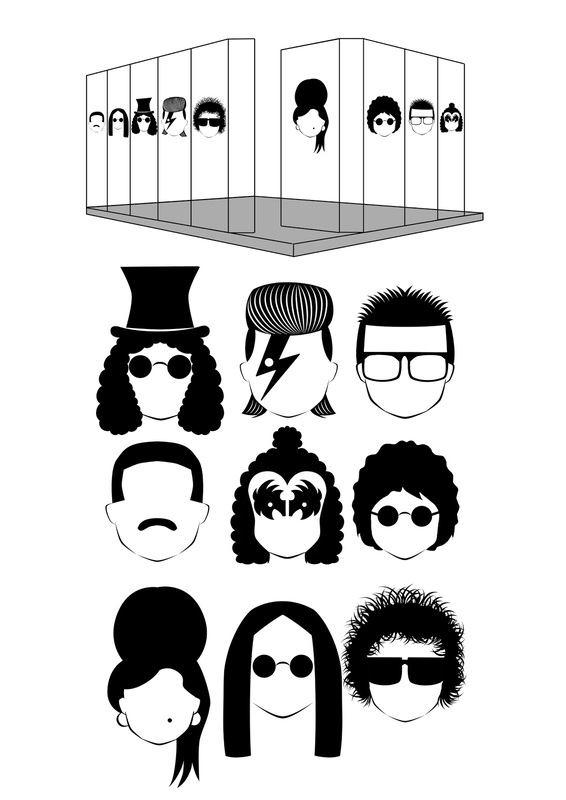 It is for this reason that I have chosen the following: Freddie Mercury, Ozzy Osbourne, Slash (Guns ‘n’ Roses), David Bowie, Bob Dylan, Amy Whinehouse, John Lennon, Elvis Costello and Gene Simmons (Kiss). Part of the reason for my proposal is because I wanted to create a design solution for the office that was interactive and made use of the glass. Hopefully the artwork would be popular with both those who work at and visit ‘Music’. I also think that the artwork is a good representation of the design agency in that it brings together both a love of simple and effective design with a love of music.